Lightning Bolt is a noise rock duo which formed in 1994 in Providence, Rhode Island, United States. The band consists of Brian Chippendale (drums, vocals) and Brian Gibson (bass). The band also originally included Hisham Bharoocha (vocals, guitar), who left the band in 1996 to join Black Dice. The band has released 6 albums: Lightning Bolt (1999), Ride the Skies (2001), Wonderful Rainbow (2003), Hypermagic Mountain (2005), Earthly Delights (2009), and Oblivion Hunter (2012). A documentary film of the band's 2001 tour, entitled "The Power of Salad", was released in 2003 . 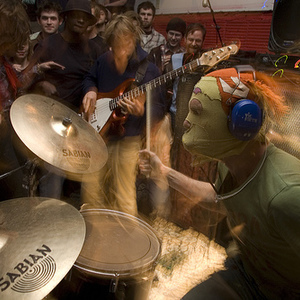 Lightning Bolt are known for their guerrilla-style live performances, where they typically play on the ground rather than a stage, with the crowd gathered around them. The band's sound is typically loud and aggressive, though the group cites composers Philip Glass and Sun Ra as compositional influences. The band formed while Chippendale and Gibson attended the Rhode Island School of Design in Providence, Rhode Island, and Chippendale had heard about "a new kid who was a whiz on the bass guitar." The two formed Lightning Bolt, with Brian Chippendale on drums, Brian Gibson on bass guitar, and with Hisham Bharoocha on guitar and vocals joining the group after their first show. Bharoocha left the group in 1996 to continue with another RISD band that would eventually become Black Dice, and Chippendale took over vocal duties. The only officially-released music with Bharoocha was a track on the Repopulation Program compilation. For the first few years, Lightning Bolt was primarily an improvisational band, touring the United States for months at a time and "just playing". The concept of writing songs and recording an album didn't occur to the band until 1997, when Ben McOsker, founder of Load Records, approached the duo. During these formative years, Chippendale and his freshman-year college roommate Matt Brinkman began to set up Fort Thunder, a disused warehouse space in the Olneyville district of Providence. The space eventually came to house a number of local avant-garde artists and musicians, including Brian Ralph as well as Lightning Bolt.